Sushi Go is all about the sushi and what you can make. In this fast paced card game, players will race to grab the best combination of sushi dishes while trying to add multipliers to their score: wasabi and dessert. You're trying to gain the most points to become the Sushi Go champion. This fun illustrated card game is great for ages 12 and up mostly due to the fast paced nature of the game. Complete with 108 cards you'll have a blast trying to beat your opponents over and over at this quick game. Check out the official game rules below to learn more about how to play. Purchase your own copy of Sushi Go today! After three round if you have the most points you'll be the Sushi Go winner. 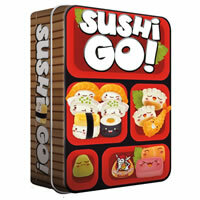 Sushi Go comes with 108 cards (14 tempura, 14 sashimi, 14 dumpling, 12 2 maki rolls, 8 3 maki rolls, 6 1 maki roll, 10 salmon nigiri, 5 squid nigiri, 5 egg nigiri, 10 pudding, 6 wasabi, 4 chopsticks) and the official Sushi Go game rules and instructions. Please keep in mind that the official Sushi Go dice-card rules and instructions could be different depending on the game version you have. The rules below are some of the exact directions on how to play Sushi Go. Share with us your comments, funny stories, tips, advice, strategies, creative ways to play, questions about how to play, problems with the rules or anything you want about Sushi Go. All submissions will be reviewed within 24 hours. Click here to add your Sushi Go comments.